The recent escalation in tensions between India and Pakistan has led to a military build-up of the Pakistani army in Gilgit Baltistan, as locals fear the conflict in Kashmir will spread north. 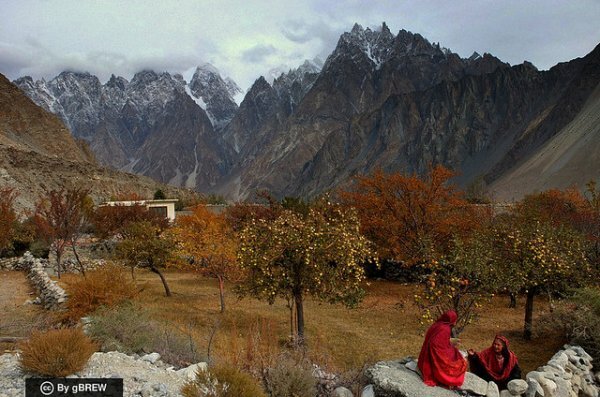 The encroachment of the Pakistani military on Gilgit Baltistan has brought the military into conflict with local people, and the region’s militarization has led to the confiscation of land and degradation of the environment. In response, local people and political parties have organized a third straight week of protests. After a brief lull, Indo-Pak forces have resumed shelling along the Line of Control (LOC) which divides the disputed Jammu and Kashmir region. The people of Gilgit-Baltistan, like many others living along the LOC, worry about war spreading north of Kashmir. Already, tens of thousands of Pakistani soldiers and paramilitary are stationed in Gilgit-Baltistan. Despite the UN Commission on India and Pakistan (UNCIP) Resolutions calling for Pakistan to withdraw from the region, the number of soldiers and settlers in the region has increased exponentially over the previous four decades. In fact, the military is already the largest landholder in the region, controlling expansive tracks of land in Jutial, Gamba, Shagari, Kharmang, Bunji, Astore, Gultari, Gilgit and Gangche. The luxury Shangri-La Resort, owned by a military officer, is also built on confiscated land. The military is operating enterprises as diverse as shopping malls, banks and bakeries. Frontier Works Organization (FWO) and Special Communication Organization (SCO), the two institutions controlling local communication and road networks, are administered by the military. Such ventures allow it paramount control over local infrastructure and institutions. Moreover, the growing military footprint in Shingo-Shigar, Braldo, Saltoro, Gultari, Deosai Plains and Chilam is the main source of water pollution, loss of habitat and endangered wildlife poaching. Military land acquisitions have occasionally led to skirmishes with locals. Brooshal Times reports one such clash on September 21  between military personnel and locals from Naltar Valley which led to three injuries. The incident occurred as military personnel were installing chairlifts during expansion of a military ski resort on a recently acquired 300 acres of land in Naltar Valley, located approximately 25 miles northwest of Gilgit city. The expansion requires clearing of forests and farmland which not only threaten local livelihoods but also diminishes fuel sources and affects patterns of pasture usage and irrigation networks. Local leaders Sheikh Nisar and Sheikh Mohsin are concerned the resort will cause population displacement and replace local sustainable land management practices with others which cause a heavy environmental toll. Cutting of ancient forests in a fragile ecosystem of Gilgit-Baltistan which only supports a two percent forest cover leads to greater frequency of avalanches and floods. This new danger targets the inhabitants of Naltar and emanates to heavily populated Nomal and Gilgit city. The local tourism economy, already struggling due to religious terrorism and continued territorial conflict, is also damaged by military encroachment. Locals denounce the military’s use of barbed wire to restrict access to popular tourist attractions. They further protest the military’s land seizure without compensation to affected communities. As protests enter the third week, elected officials from Awami Action Committee, a conglomerate of 22 regional political parties, visited Naltar to affirm their support for local rights and call for the military to vacate the area. Safdar Ali, a local leader from Balawaristan National Front, believes that encroachment of common property casts a shadow on the military’s claim to develop tourism in the region. Local leaders claim that the UNCIP Resolution also restrict the regional government of Gilgit-Baltistan from allotting lands to non-locals, including Pakistanis. Wazir Ibadat, member of Gilgit-Baltistan Council, told the Daily Salam that land allotment is banned in the entire region and that the military has no legal right to acquire land for the ski resort. Local political leaders have asked the Pakistani government and military to respect the State Subject Rule which protects the interests of local people. They cite the Universal Declaration of Human Rights affirmation of the right to First Prior Informed Consent (FPIC) of land owners in such projects. They assert that, as a member of the UNO and signatory to UNCIP resolutions, Pakistani military is obliged to protect the life and assets of the people of Gilgit-Baltistan. The Pakistani military encroachment of local land is a consequence of violations of UNCIP Resolution and international human rights frameworks. The continued denial of local rights has resulted in loss of livelihood, land and environment. Illegal settlers have become the long arm of state apparatus undermining the voices and rights of the locals. Illegal settlements and land encroachment is changing ethnic demography and affecting local representation in political institutions. The military’s highhandedness is encouraging the terrorist Islamist groups to gain hold and spread their agenda in Gilgit-Baltistan. A colonial system exists in the region—as suggested by Pakistani Senator Afrasiab Khattak—which hinders locals from effectively managing their resources and social institutions and creating a peaceful and secure environment. The incidence further demonstrates the determination of the people of Gilgit-Baltistan to demand reinstatement of State Subject Rule and enforcement of the UNCIP Resolutions.